Note as mentioned above, the canceled global sim card is data sim and doesn't have a phone number, just the account name. Also, I have a Premium VIP Service so I can't call support or submit a ticket. 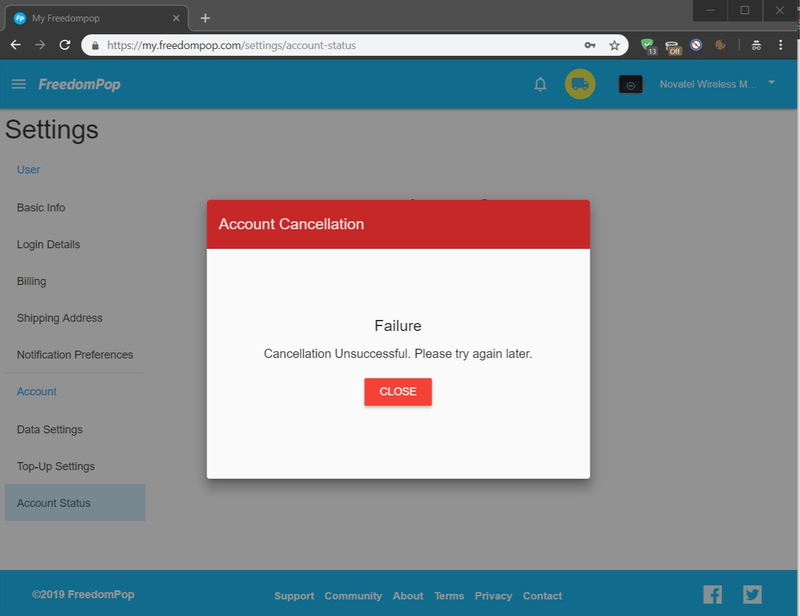 I followed the instructions but still getting the "cancellation unsuccessful" error (see attached screenshot). I tried multiple browsers (Chrome, Edge, IE) and devices (Windows 10, Android) but still getting the same error. I also tried calling the 1(800) 663-1791 but it says I should send a cancellation request which I can't do since I'm not able to submit a ticket. I would appreciate if you could help me cancel this account and transfer the credit. We have completed your request, the account with the Novatel Wireless MiFi 2 has been canceled and we transferred credit of $5.00 to line 8287. If you experienced issues, please try to perform this action from an incognito tab on your browser by pressing "Ctrl + shift + N" in the keyboard while navigating. You may also try to clear cookies and Cache of the web browser or Try in a different browser. If the issue persists please forward a screenshot of the error you get. After you cancel the account, we can go ahead and transfer the credit.